It is that part of the year-when the Indian industry-wakes up after the festival euphoria ( for most businesses, Diwali time is a pretty big season, and for the employees a great reason for bonuses/ appraisals! )-and tries to take stock of -the impending future! 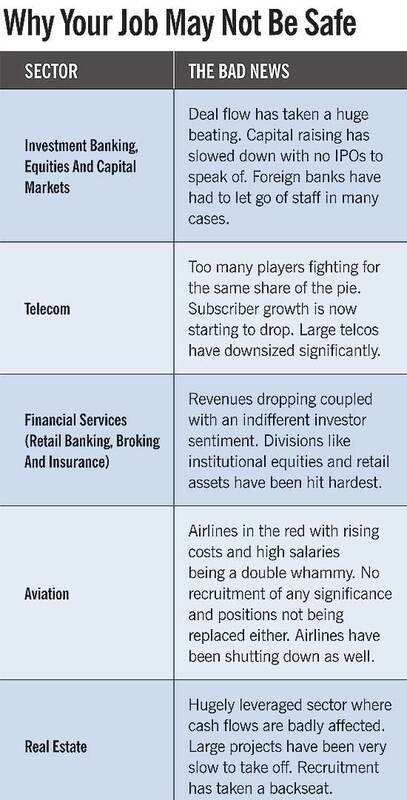 The latest Business Outlook magazine predicts the returns of the pink slips in India!! The graphic compares the figures by Ma Foi Ranstaad survey -is self explanatory. 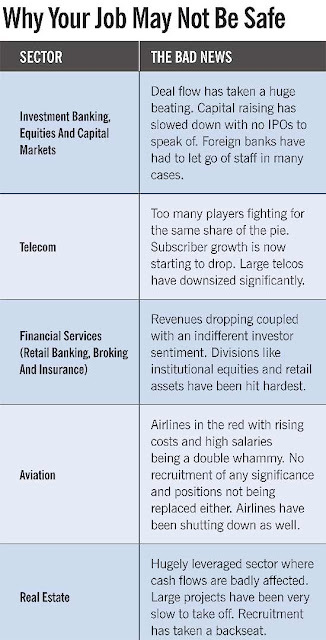 The article also lists out a rather uncomfortable run down of some of the big names -across different industries-that have either announced recent lay-offs globally and some in India. Not to mention the sense of uncertainty-that fuels the rumours of a possible recruitment freeze in the coming couple of quarters! Interestingly, the traditional 'old economy' manufacturing industry seems to be the only growing sector -as most others 'hitherto' fast growing employers -especially in the real estate, Energy and BFSI seem to have hit speed breakers! Education, Training & Consultancy, as well as Health care & hospitality -being touted as the 'recession proof' domains-together contribute to a fair amount ! Personally I feel the overall global sentiments have percolated to most sectors within the country too. Most companies have tightened their belts-and have laid off 'non performers' over the last couple of years, and most importantly, haven't felt the need for 'back-filling' the jobs. -adopt a wait -and -watch policy and see how the economic situation plays out. -a 'need based' and very selective senior-executive hires. -increasing the employability of the talent rather than hiring for doing a job! -increasing the ratio of 'temporary staffing' to that on permanent roles until they are sure of the value add is imminent! 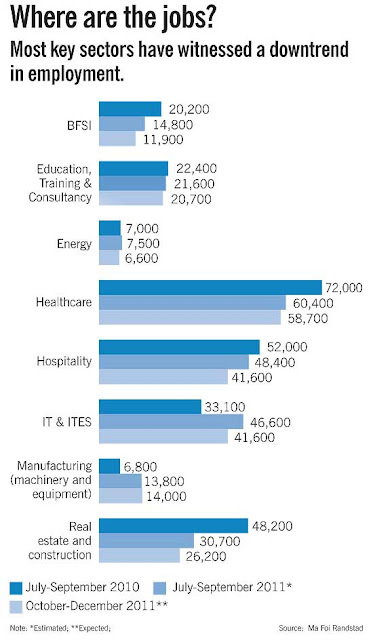 -- a change in the hiring strategy and increasing their ratio of campus hiring. Interestingly, the starting salaries of the freshers from campus-hasn't changed since the last couple of years. It is all happening right? What worries me is that the domestic Indian growth story has been also hampered -due to the increasing interest rates. One has lost count..but I trust there have been atleast 13-14 hikes in the RBI repo rate -since March 2010. And add to the inflationary trends that the increase in petrol prices ..contributing very aggressively, it could turn into a 'catch 22' situation if the industrial/manfacturing sector would be affected!! On the flip side- the tough times will certainly bring out the best in all...and who knows, the long term growth story may well be nearer ! !